[NEW GADGET] Motorola Charm and Motorola Flipout, probably the only others to be mentioned in the same bracket as the latest Samsung phone, GALAXY Pro. The first thing to come to mind is the resolution of the screen, not sure if the screen resolution is going to a problem for some apps since Android apps are generally produced for full touch screen phones with a vertical rectangle display. But that is also the flexibility that Android offers and in turn gives consumers more choices. 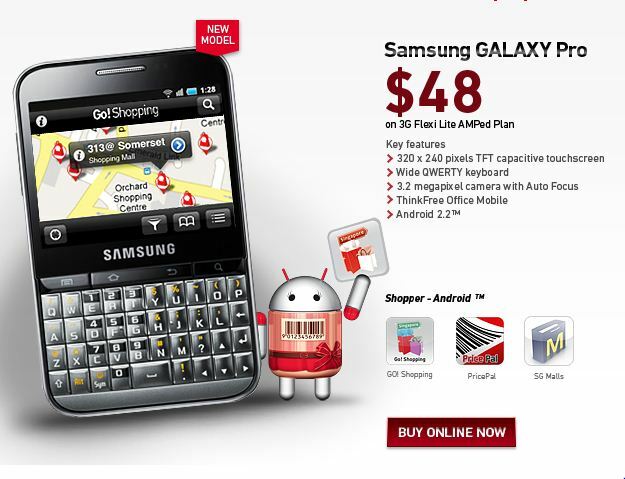 In this case you get a touchscreen as well as QWERTY keyboard. Samsung GALAXY Pro is going for S$48 with a 2 year SingTel 3G Flexi Lite AMPed Plan.